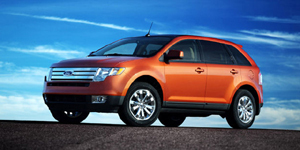 For 2008, the Ford Edge offers more equipment and a new Limited model. The optional navigation system adds voice activation, while an interior appearance package has red seating surfaces with contrasting stitching. Other options include a power liftgate, and the Ford Sync system.